The above picture is me sitting at a bar/cafe in Marina Casal Velino Italy (Campania). This is in Italy’s National Park, Cilento. Across the street is the beach and the mighty sea. This bar has free WiFi so it is a great place to rest, catch up on emails and Facebook while having a gelato (ice cream), Panini (sandwich) or a drink. The Coffee called Cafe´(espresso) is fantastic. 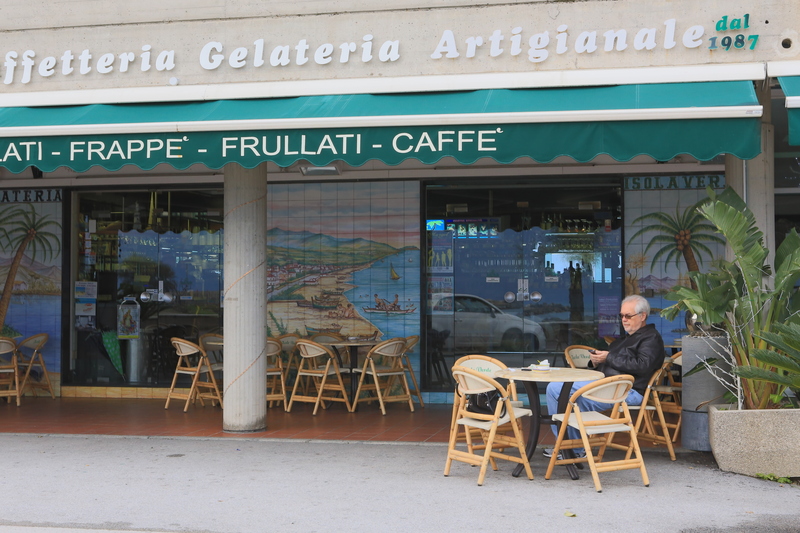 The machines produce such a great cup of coffee that Italians always go to these bars in the morning for a cup. Imagine relaxing with a glass of wine after a day of walking around, you are on WiFi but you keep looking out at the sea. Palm trees are everywhere. This is our beach. Life is to be enjoyed! So what are you waiting for? Romance and adventure await you.